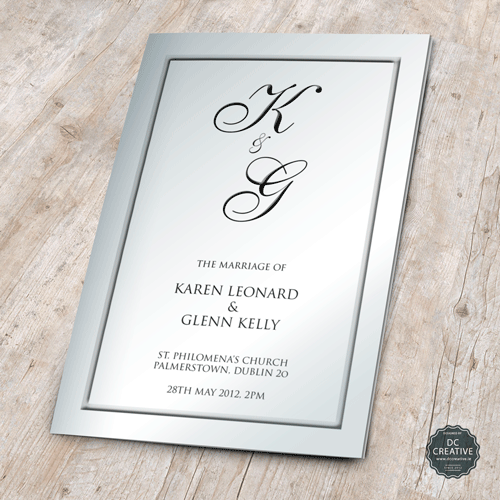 Black and white personalised wedding mass booklet. If required we can email you a mass template (MS Word) for the content of the booklet for hassle free ordering. Please allow up to 2 weeks to print and deliver booklets once all is approved. "Delighted with the price, the customer service and the speed at which everything has been sorted. Contacted Declan about a rush order and got absolutely top notch service. Wouldn't hesitate to recommend him. Love the booklet cover also. Has been a stress free transaction. Much appreciated- thanks again!! - Lisa Schrimsher"
Please Note: If you are supplying your own file we only accept PDF or Microsoft Word files with page size a4 in portrain mode (tall). Please do not send in file with two column layout as we do not use this format and will only hold things up. We do not make changes to the content of the booklet so any changes will have to be made by you the customer.